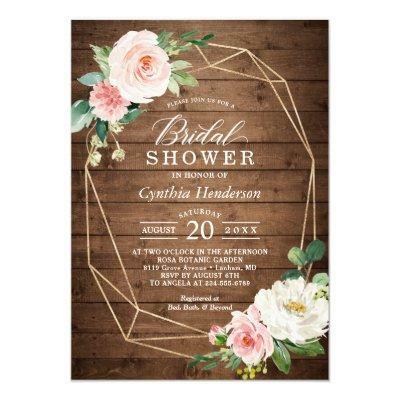 Celebrate the bride-to-be with this "Rustic Floral Themed Bridal Shower Invitation" that features a Modern Geometric Frame and Blush Watercolor Peonies on a Wood Grain background. It&#;s easy to customize this design to be uniquely yours. (1) See more matching items: (2) For further customization, please click the "customize further" link and use our design tool to modify this template. (3) If you prefer thicker papers / Matte Finish, you may consider to choose the Matte Paper Type. (4) If you need help or matching items, please contact me.